Miso soup (made from fermented soybean paste and instant dashi powder) provides a good, hearty base for the broth in this dish. Mix the teriyaki sauce, soy sauce and oil, and turn the salmon in the mixture to coat. Preheat the grill. For the broth, bring the stock to the boil, then add the mirin, soy sauce and mushrooms; simmer for 3 minutes. In a small bowl, mix a ladleful of the broth with the miso paste or powder, then pour back in, whisking well. Simmer the tofu cubes in the broth for 1 minute. Grill the salmon for 4–5 minutes on each side until the skin is crisp but the flesh is still just pink inside. Ladle the broth into bowls; scatter over the spinach. Top with the fish and scatter over the sesame seeds. 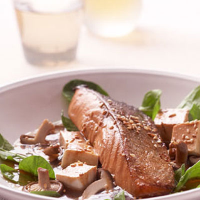 Zingy riesling works well with this Japanese-style salmon.